Good, solid analysis and clear presentation make this best-selling commentary series an excellent resource for pastor, student or layperson alike. Perfect for pastors, teachers & Bible students at all levels. 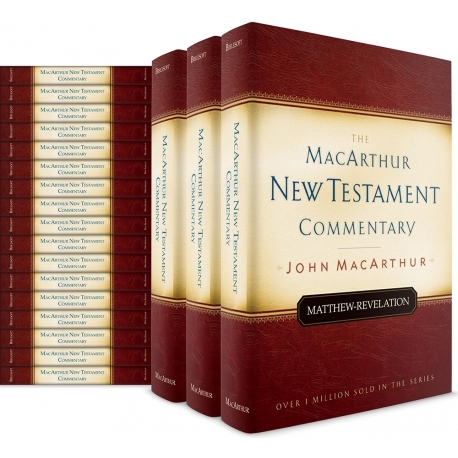 NOTE: If you already own a previous 21, 23 or 24 volume release of the MacArthur NT Commentary, you are entitled to special savings on an update to the 26-volume edition. Please call us at 1-866-722-4253 (M-F, 8am-5pm PT) to place your order. Good, solid analysis and clear presentation make this best-selling commentary series an excellent resource for pastor, student or layperson alike. A gifted preacher and teacher, John MacArthur writes for popular use making the text easily approachable, but without watering it down. In fact, these volumes represent the accumulation of a lifetime of intense Bible study, bringing formidable exegetical skills to bear on most of the New Testament books. Enjoy practical, insight and thorough comments for every verse in these covered 25 New Testament books in 26 commentary volumes. This expertly crafted exegesis will help you understand what the passage says, what it has meant throughout history and how it applies to your life today. As you explore the message of each verse, you will see more clearly the larger Biblical principles involved and how one passage of the New Testament relates to another. In addition, you will also come to appreciate the details, like the translation of key words from the Greek (linked directly to your lexicons! ), the history of these words from the Septuagint, the theological development of significant themes from the Old Testament to the New Testament, and much more! When you add the MacArthur New Testament Commentary Series to PC Study Bible, it will automatically integrate with your current library. Its helpful comments and applications will be at your fingertips as you study a Bible passage. Likewise, when you read the commentary, every Bible reference is linked, so that you may display your favorite translation instantly in the Bible pane. • 1 Thessalonians + 2 Thess. In addition, the MacArthur New Testament Commentary is SmartReferenced™ to your entire library, so you'll automatically know when it has information that will help with the specific passage you are studying. You're not simply adding another great title to your collection, you're bringing the full power of PC Study Bible to all these volumes: read, search, compare, discover – all in the context of Bible-centered study.